This is a beautiful second-floor flat in a building built in 1906, lovingly remodeled and restored to retain the charm of the last century but has modern conveniences. Windows on all sides of the building making for lots of beautiful light. Great flow, gorgeous oak floors, Douglas Fir trim, high ceilings, beautiful finishes, original details, Carara marble shower, marble floor in bathroom, granite countertop and stainless steel appliances (microwave, gas range and oven, dishwasher) in eat-in kitchen, lovely dining room, washing machine, and small south-facing deck overlooking sunny backyard. A dream for those who prefer not to drive-- walk (or bike) to downtown (5 blocks), to U.C. 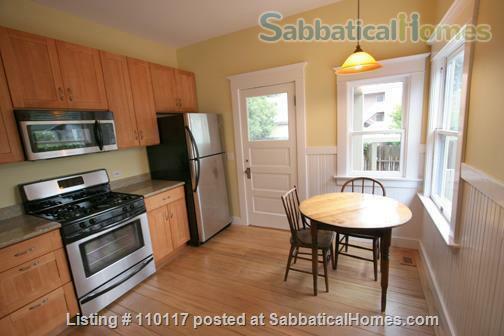 Berkeley (6 blocks), to BART, metro system that takes you to San Francisco, Oakland, airports, and beyond (7 blocks), to the Farmer's Market, parks, cinemas, and restaurants and cafes, the closest of which is just 2 blocks away. Close to schools (private: Montessori, Berkwood Hedge, public: Washington Elementary School just around the corner, Berkeley High School a block away). Kitchen full of pots, pans, and utensils. Bed linens and towels provided. Double bed in one bedroom, day bed with trundle bed in the other bedroom/office that can be set up as two twin beds. Small office alcove as well. Cable TV, wifi. I have hosted many visiting scholars, including with families, affiliated with different institutes and departments at UC, and everybody always has an enjoyable stay. I enjoy meeting people from all over the world. I enjoy travel quite a bit, and have worked abroad, in Latin America, Asia, and Europe, and was a Fulbright Fellow in Colombia a few years ago. I am a photographer and filmmaker.